Sunday Streets is coming back. More neighborhoods, more Sundays. We need your help to make it a sucess. This is a tough year to raise money, but it’s a good year to provide free fun events for people to enjoy. Bike, walk, dance, yoga and hula hoops – it’s all coming back. 1) Sunday, April 26: Waterfront Route running along the Embarcadero–from AT&T Park to Aquatic Park. 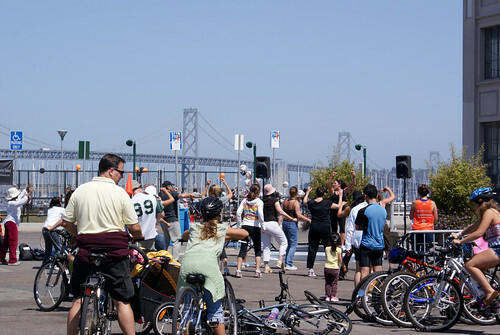 2) Sunday, May 10: Waterfront Route in the Southeast Sector, highlighting the San Francisco Bay Trail, which is celebrating its 20th Anniversary in May. From AT&T Park to the Bayview Opera House, along the Bay. 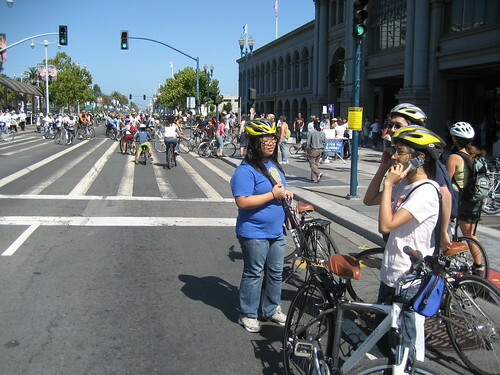 3) Sunday, June 7: New route for 2009 through the Mission, engaging new neighborhoods in the Sunday Streets movement. 4) Sunday, July 19: Same route through Mission. 5) Sunday, August 9: Great Highway Route. Connecting Golden Gate Park to the San Francisco Zoo, along Ocean Beach. 6) Sunday, Sept 6: Same route along the Great Highway. Go to the website, volunteer, donate, join Livable City and help support more fun car free events. Let your City Supervisor know you support Sunday Streets. Come out and Play. You mentioned earlier on your site that you have a bike rack but no car. I assume you have a rack you use on rental cars. I also have no car and am interested in investing in a bike rack. Can you advise me on what type rack to get for this use? Thanks! Hi ritiki, we have a Rhode Gear – I think the model is a super shuttle. Pretty easy to use – we’ve used it on probably 15 different vehicles – car trunk, hatch back, minivan, suv… Once you master the set up for different angles it’s great. Good luck. Hi Rich & Cheryl — good meeting you on Amtrak yesterday. Hope you had a good weekend! Hi Fritz – good to meet you as well – I’m just about to blog about our car free weekend via Amtrak. It was very fun.